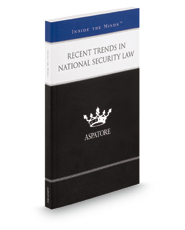 Aspatore legal title Recent Trends in National Security Law provides analysis of the crime and national security concerns that have arisen in surprising places. Today's national security climate involves a unique and dangerous situation not only for the federal government, but for private entities as well. Recent Trends in National Security Law gives you in-depth analysis of the serious national security threats that jeopardize our nation's future, the volatile intersection of political crime and national security, and a discussion of the Government's role in cyber threat “vulnerability mitigation” – i.e., strengthening our cyber defenses to reduce the nation's vulnerability to cyber attack and cyber espionage.